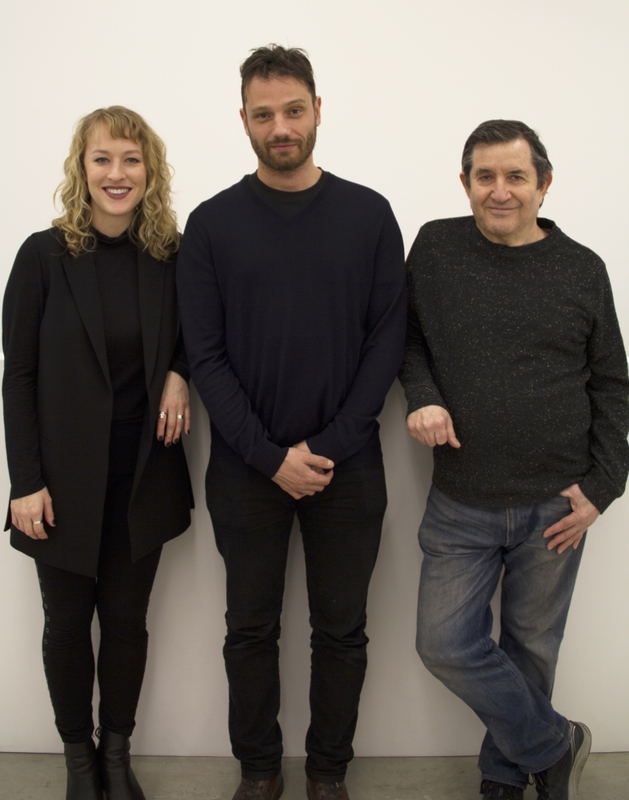 Lower East Side gallery MAGENTA PLAINS was founded in 2016 by David Deutsch, Chris Dorland, and Olivia Smith. We sat down with the founders to talk about the process of opening a new gallery, the benefits of an intergenerational perspective, and the ways in which the gallery has evolved over the past two years: the gallery recently began representing artists, and will announce its artist roster later this month. Independent: What’s the gallery’s origin story? How did you three come together to open MAGENTA PLAINS? David: I’d been thinking about opening a gallery, but knew that in order to do it, I needed to find someone really good to help run it, someone with ideas and passion. And I thought of Chris, who I’ve known since the early 2000s. Chris: I actually previously worked for David, in his studio. David: Chris and I had a drink one night and put a lot of ideas together; we shook hands right then and there. But we knew we needed someone else, too. And Chris thought of Olivia. Olivia: When I was approached by David and Chris, I had an immediate feeling that it was just right. I met with Chris to talk it over, and within three days I met David and accepted. There was something that just sparked between us. Chris: It turned out to be a really fortuitous leap of faith that the three of us took together. Independent: One of the most important threads in the gallery’s program is the intergenerational aspect: you bring together different generational and art-historical perspectives. David has been in New York since 1970, and brings that historical memory to the table, whereas the younger partners, Olivia and Chris, are in their 20s and 30s respectively, and bring a sense of what might resonate with younger emerging artists. Chris: When I was first working for David, I was so young and enthusiastic, and I’d tell him about shows I was seeing and artists I was discovering, and he’d tell me about the omissions, and the people who were getting left out of these historical narratives. David was really devoted to looking at artists who were not getting their fair due. And for me, that was one of the most exciting things about the conversations we had around starting the gallery. I’m an artist as well, and I wanted to advocate for people: that’s a core part of how the gallery functions. Anne Libby, "Acting Blanks", 2017. Glass, wood, formica, polyethylene, powder-coated steel, mylar. Don Dudley, "Untitled (Aluminum Module)", 1973. Acrylic lacquer on aluminum. Courtesy Don Dudley and Magenta Plains, New York . Peter Nagy, "The Super Strings", 1986. Acrylic on canvas. Courtesy Peter Nagy and MAGENTA PLAINS, New York. Oil on Linen; Black and White Photograph in Altered Frame. Courtesy Magenta Plains, New York. Installation view, William Wegman, 2016, MAGENTA PLAINS. Olivia: The intergenerational aspect of the gallery gives us a breadth of knowledge. It’s really inspiring for us to make connections between older artists and emerging artists. And for some of the younger artists we work with, it allows them to make new associations, to see themselves and their practice within a timespan that’s longer than the five or ten years that they’ve been working. Independent: The intergenerational emphasis in the gallery is also very present in what you’re planning for Independent in March: you’ll be exhibiting works by Anne Libby (b. 1987), Peter Nagy (b. 1959), Don Dudley (b. 1930), and Steven Parrino (b. 1958). How did you decide to put these artists together? Olivia: Independent will actually be our first art fair, and we really wanted it to reflect who we are as a gallery. So we definitely wanted to have the intergenerational bent to our booth. We had mounted a show in the spring of 2017 with work by Anne, Peter, and Barry Le Va, and we saw a really amazing connection between Anne and Peter’s work. And then we did a solo show with Don in September. Chris: I think of it as really evolving out of our Libby/Nagy/Le Va show. It’s also a real New York presentation: Don was a Minimalist painter active in the 1970s, Peter was a major figure in the New York art world in the 80s and 90s. He also had a gallery in the East Village, Nature Morte, which represented Steven Parrino and launched his career. Peter is based in New Delhi now, but I think of him as a New York artist. And now we’re also introducing Anne, who is representing a younger generation of artists working in New York. And their work all fits quite well together in terms of thinking about the legacy of minimalism. It’s hardly a history of minimalism, but these artists have all in some way been inspired by that language. Olivia: All of the artists are doing a lot with a really concise language, and a restrained palette. There’s also a common thread of seriality and modularity. Independent: What has the experience of starting a new gallery been like? Have there been challenges? Olivia: When I think back to this time period, early 2016, when we were first opening the gallery, and what our hopes and dreams were, I feel like we’ve not only been able to uphold our integrity and fulfill the goals that we set, but surpass them. The challenges have been to take our own time and not feel the need to conform to a model of how a gallery operates. For instance, things like doing art fairs, or having a roster of represented artists: these were things we always planned on, but we wanted to do it on our own schedule. And now, two years in, we’re at a point where we can really experience the rewards of doing things at the pace that felt right for us. Independent: Chris and David, you two are both practicing artists—Chris just opened a solo show at Lyles & King. How do you think that affects your approach to being gallerists? Chris: David and I have both had a lot of experience working with galleries as artists, and in some cases, that’s given us a sense of how we don’t want to do things: we’re aware of what’s unpleasant from the artist’s perspective. And galleries don’t always take that into consideration. Olivia: There’s a lot of empathy and understanding of the process of how things happen in the studio. Chris: We bring an artist’s flexibility, too. We put a premium on flexibility and creativity. David: We also feel really gratified when we sell work and can give artists the money they deserve. That’s one of the most satisfying components of running the gallery. Olivia: Helping the artists we work with gain public recognition is the most exciting part. We want to support and draw attention to the work we really believe in—and when we’re able to get other people to believe in it too, and to put their money behind it and want to live with it, that’s the best thing we can ever ask for.